Hello Blue Snow. - Jill Ruth & Co. 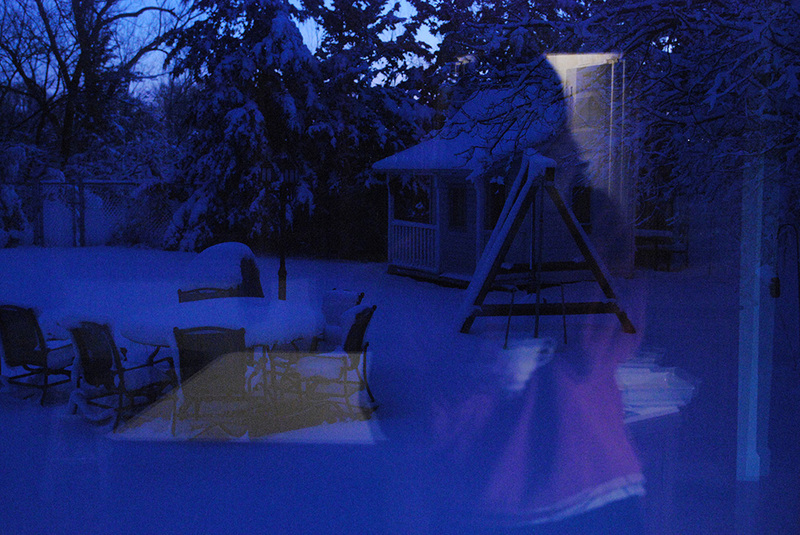 I caught my reflection this morning in our kitchen window. Warm and toasty inside superimposed on crisp and cold outside. The light from the door is our pantry light reflecting in the window and the horizontal spread of light is from our white countertop. We had about a foot of snow Friday night and although I'm not thrilled with scooping, it is beautiful. I ran out late this afternoon and with just the last rays of sun, snapped a couple of pictures in the tank garden. The white balance on my camera is not off. Everything was so blue. When my son and I were scooping yesterday, we noticed how you could see the most beautiful blue light in each crevice of snow. I should have taken the time to get my camera, it really was amazing. 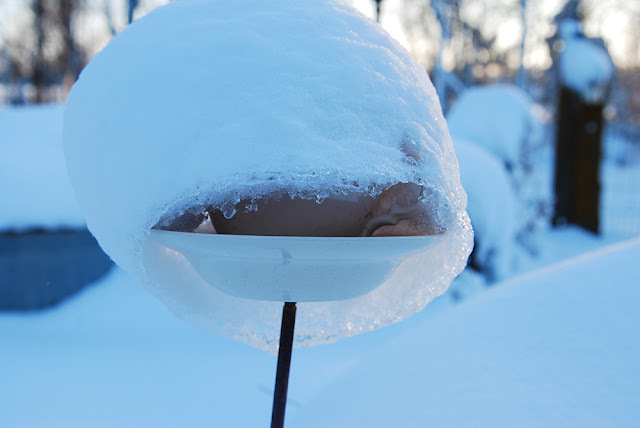 One of the tea cup bird feeders with a little cap of snow. The late afternoon sun is fleeting and deceptively warm looking, but so inviting. 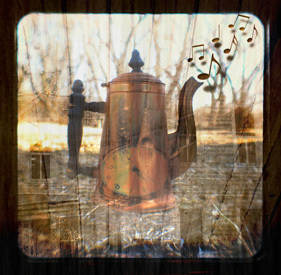 I'm so glad you have a camera ... And have a blog ... And share!! Snow is so beautiful. It's not much fun to shovel, though. I love the blue light of the photos. 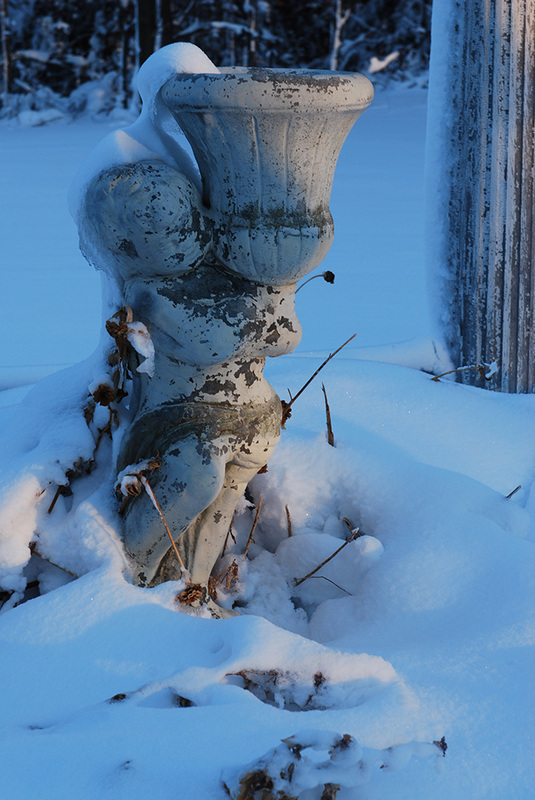 And how sculptural your tank garden elements look with a cap of snow. In my travels through blogland once upon a time there was a post about the blue time of night.....the bright hues of blue. With your photography I'm sure you have heard of it. We missed this storm once again...just a light dusting. I love snow pictures. And the blue moonlight last night was unbelievable! I stood out on the porch and marveled at how bright it was with the moon on the snow and low fog forming. Beautiful (but c'mon Spring!). Beautiful pictures! 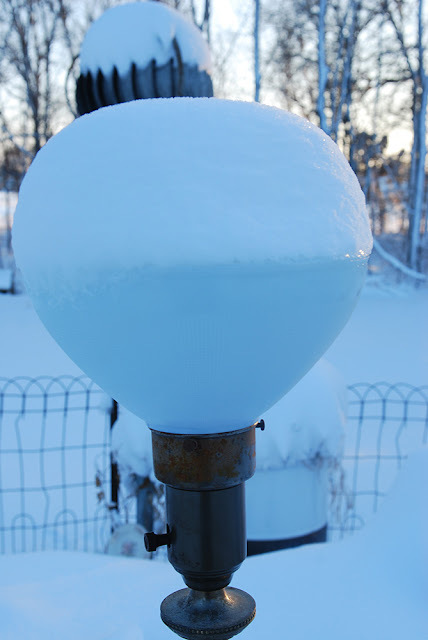 I love the teacup bird feeder snowcap! 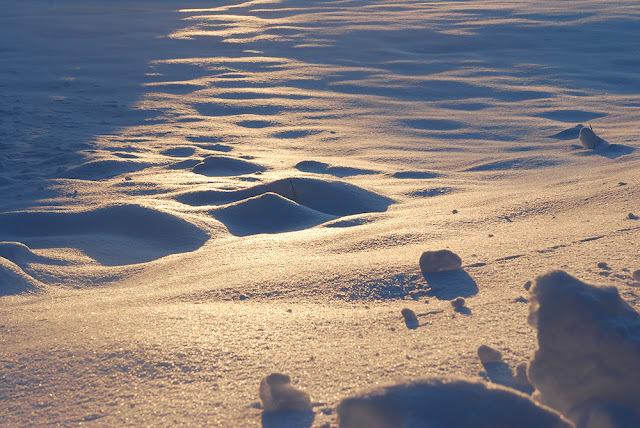 That is one of my favorite colors-- the color of snow shadows!